The academic field known as financial engineering was developed with a view to reducing the uncertainty of future risk as much as possible. A variety of financial products that have been developed and which make full use of advanced mathematics have seemed to decrease the risks to which financial institutions and companies are exposed, and to be effective in stabilizing business. However, placing too much trust in theory may give rise to adverse effects. Such effects may lead to large-scale systemic risk (*1) spreading throughout the financial sectors of the world such as was the case with the Lehman shock. In fact, large-impact losses have happened one after another since around 2000 and the records for the largest bankruptcy cases in history have had to be updated yearly. It is also said that this situation is caused by “greed capitalism” in which investment funds give too much priority to profits. “Why is liquidity that may lead to chain bankruptcy among banks happening so frequently? 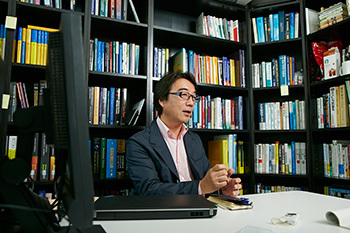 I suspect that high-frequency and high-speed trading in the market is one of the causes of this problem,” says Professor Inui. I am paying particular attention to the impact of high frequency trading (HFT). In the current stock market environment, automated programs allow for stock transactions to occur at a rate of one million per second. But I have some doubt as to whether such a speeded-up pace of the market is really helping improve convenience. Rather, isn’t this causing market disruption and a decrease in market liquidity? I have been engaged in research under the assumption that HFT can be a cause of systemic risk like chain bankruptcies among banks. I would like to make specific recommendations regarding a new paradigm for the future market. My analysis is based on the TICK data (detailed data on each transaction).The First Section of the Tokyo Stock Exchange has about 3GB of data flow per day. We can call this big data. As such, an enormous amount of detailed transaction data has become available and we can now analyze what we were not able to analyze before. For example, the analytical data used 3 or 4 years ago had only 4 basic transaction prices: Opening price (the price of a security at the beginning of a trading day on the stock market); the highest price; the lowest price; and the closing price (the price of the last transaction completed on a trading day). These daily prices are the most detailed data we could obtain. However, data is now available in milliseconds. Because much more event data from the tail of the probability distribution is available now, it is possible to analyze outliers that are crucial in risk management, but could be rarely observed before. 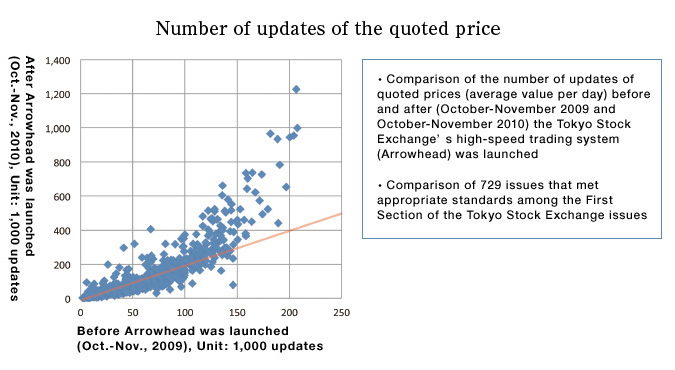 In the graph, using the average value per day, the number of updates of indicative prices was compared before and after the Tokyo Stock Exchange’s high-speed trading system (Arrowhead) was launched. Buying and selling orders for the same issue were updated at 5 to 8 times greater frequency. If the cause of the problems that adversely affects liquidity lurks in the market trading system itself, we need to come up with some sort of plan for its improvement. Let’s look at the market from a different angle. New financial products and transaction systems that appear one after another in the market are part of the process of completing an incomplete market. For instance, when a financial product that enables risk transactions is newly developed, risk management also becomes possible. Moreover, the respective risk management is available for determining the market and credit risk. Each of these events is considered to be a part of the rapid completion process of the society. However, is HFT happening at one millisecond really a completion process? As transactions that were not available before have become increasingly minutely handled, the completion process seemingly advances. However, this completion process may only work for those who have some sort of means to evaluate the transactions. Conversely, this is a non-completion process for those who have no means. In the traditional stock market, stocks were traded at the indicative price appearing on the “board.” However, trades occurring at a millisecond are too fast for people to observe. In the eyes of those with the means to observe and analyze, other traders without this means appear to have stopped trading. Slow general investors are passed by at tremendous speed, and those with the means continue to gain profits. By the time those without the means notice, it is too late to trade at their desired price. If this becomes more obvious, it will not be surprising if general investors become reluctant to trade. The service called “Co-Location” provided by the Tokyo Stock Exchange enables a transaction to be conducted at the rate of a microsecond, faster than one millisecond. If an increasing number of general investors lose interest in stock trading because of this issue, the number of individual investors will decrease. This would not be of long-term benefit to those who have the means. Currently HFT occurs on more than 50% of stock trades in the Tokyo Stock Exchange. If high-frequency, high-speed trading can create such concerns, we need to prevent the excesses and do something to enhance fairness and transparency. If a proposal from someone can create a discussion regarding this matter, it may lead to the implementation of improvement measures. I think this will stabilize the market, increase the number of individual investors who will consider risk funding, and decrease the funding costs borne by companies, thus benefitting business owners. HFT is not entirely flawed. In general, the market has operated more efficiently because of HFT. The problem is that only those who have the means can benefit from HFT. Since this is the case, one of our challenges is to seek solutions that can benefit everyone. It will most likely be the firms with completely new ideas that provide such new beneficial services to general investors. Then the financial industry will no longer be a key player. 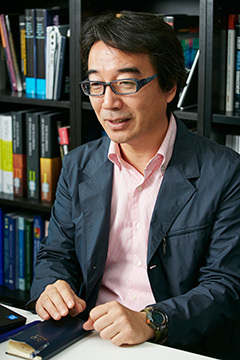 With this in mind, I agreed to conduct joint research with Oricon Inc. in May 2013. 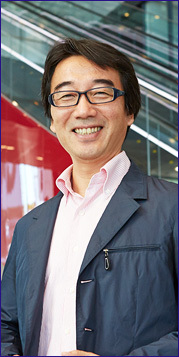 As you know, Oricon is a company with long experience in providing data services in Japan. As it is free from the constraints of the conventional practices of the financial industry, Oricon has the potential to offer new added value to general investors by virtue of its completely new ideas. Financial engineering is a field of engineering. The role of engineering is to make a realistic proposal even if it is not perfectly theoretically consistent. In this sense, my research substantially overlaps practical operations. This field of study is closely linked with real financial practice, and has an influence on society, which can be the charm of financial engineering. I find it quite interesting to support the efforts made by a newcomer like Oricon because it may help create an environment where long-term risk funding can be provided to many investors, and will eventually lead to the growth of stock investments in Japan. The risk of insolvency of an individual financial institution, or the collapse of a specific market or financial system, can cause a cascading failure, thus bringing down other financial institutions or markets, or the entire financial system. Graduated from the Tokyo Institute of Technology.